General office chair with rounded edge is designed for use on carpets up to 1/2" thick. Friendly grippers offer maximum hold. 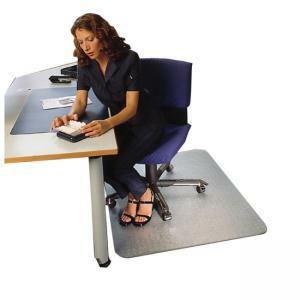 Chair mat protects carpet and allows easy movement. Extremely durable chair mat won't curl, crack or discolor. Polycarbonate material is fire-resistant, extremely durable, odorless, environmentally safe and completely free of toxic chemicals. Rectangular chair mat is ideal for many different applications from supporting chair movement to protecting carpet in heavy traffic areas, such as vending machines and reception.